Open all the clips so they are ready to be inserted into your hair. 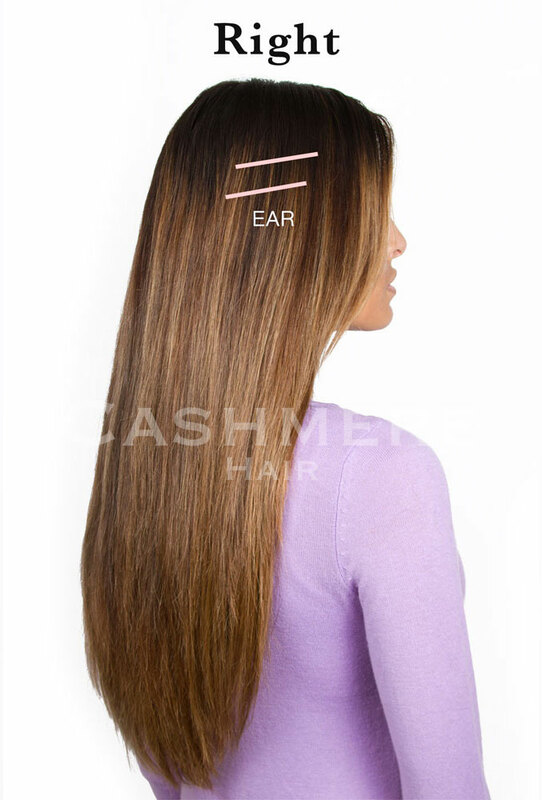 CASHMERE HAIR ® Clip in Hair Extensions should be attached from the bottom up. For a clean and straight part use a tail comb when creating a part where you wish to section off the hair. 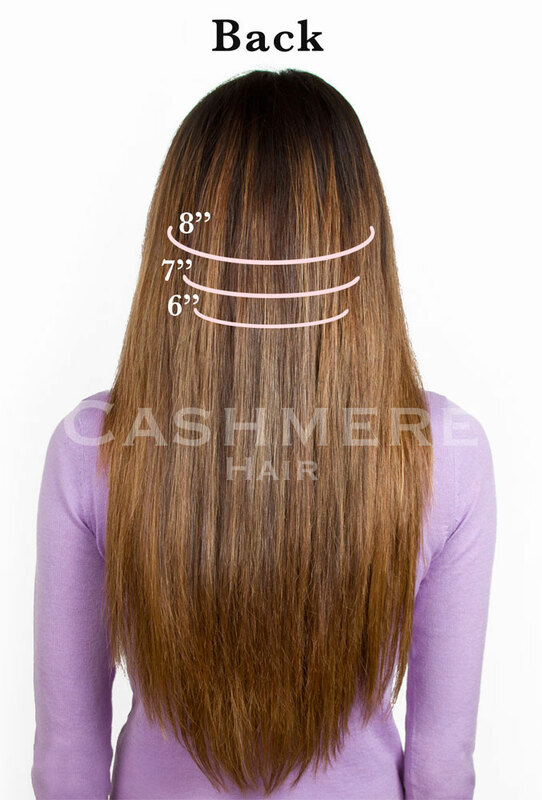 You can choose to place Cashmere Hair Extensions in any way that you see fit for your needs. Below is just a suggested method of wearing them. If you feel like it's too much hair for your head, feel free to clip in less tracks. Always start by inserting the opened center clip just below the part. Always insert the clip onto your hair & never directly on your scalp. Snap the clip shut, so it grips your hair. 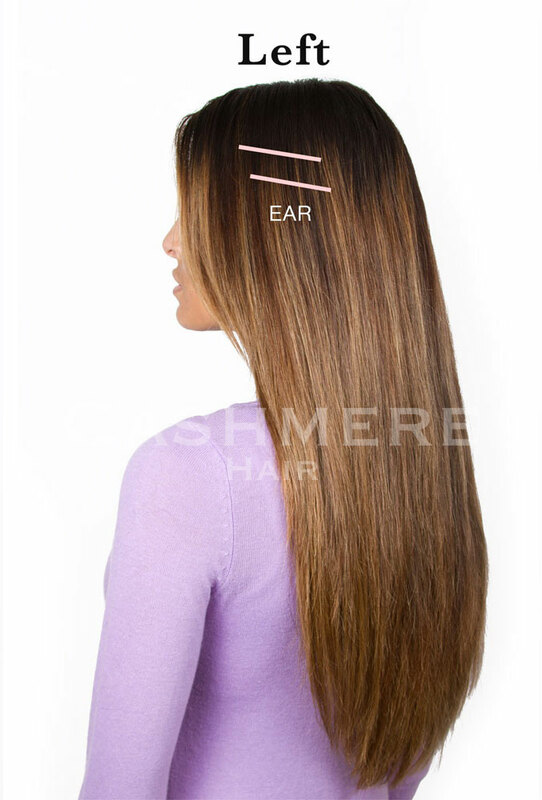 Use a tail comb to horizontally part your hair about 1 - 2 inches above where your hair starts on the back of your neck. Clip your remaining hair on the top of your head to keep it out of the way as you clip in the tracks. You can part as low as you want to place the first weft. Starting with the 6" wide track, clip in the track to the hair below the part. Next, Part hair 1 inch above 6 " track & clip remaining hair up. Clip in 7 " track to the hair below the part. Part hair 1 inch above 7 " track & Clip in 8 " track below the part. Part hair on side of head 1 inch above ear, & clip in one 3" track to the hair below part, starting with the clip closest to your face. Keep this clip far enough away from your face to conceal it with your own hair. Part hair on the left side of head 1/2 inch above 1st track & clip in the 2nd 3 " track to the hair below part, starting with the clip closest to your face. Part hair on the right side of head 1 inch above ear & clip in the 3rd 3" track to the hair below part, starting with the clip closest to your face. Next, part hair on side of head 1/2 inch above 3rd track & clip in the 4th 3 " track to the hair below part, starting with the clip closest to your face. Finger comb or brush to blend your hair with the extensions. You are ready to style your hair! Pull your own hair into a ponytail. Start wherever you would like to attach the ponytail at but we recommend wearing a higher ponytail for a more secure ponytail. Make sure that the elastic that you use for securing your own hair into a ponytail is strong and wrapped very tightly around your own hair. It needs to stay in place and will help hold the weight of the Wrap Ponytail. Place the wire comb either underneath the elastic band or between your hair and the ponytail holder. Depending on your own hair, try either method of placing the wire comb to see which one works better to secure your ponytail. Wrap the ponytail’s left side underneath your ponytail and meet with the velcro on the right side and pull to overlap velcro and secure tightly. Use the remaining section of hair to wrap tightly around the base of the ponytail to conceal the band. Secure the wrap around section of hair with a bobby pin or 2 to hold it in place. Brush or finger comb to blend your hair (inside the pony) and make sure that the Cashmere Hair pony wraps around your own hair to conceal/hide your hair inside (if shorter) or blends with your. Use more bobby pins to help secure the ponytail further if you feel that it needs more anchoring. Also, check out our VIDEOS or for more styling ideas, visit our BLOG.